Whether you cruise here on the ocean or fly over it, you’ll enjoy breathtaking views of the Gulf Islands, the Strait of Georgia, and coastal mountains of British Columbia on your way to beautiful Vancouver Island. Vancouver Island is accessed by vehicle/passenger ferry service from mainland British Columbia and Washington State in the U.S. Air service to Vancouver Island is provided into Victoria, Nanaimo, Comox, Campbell River and Port Hardy. Bus transportation is also available to Vancouver Island. Please use the links to the left to access more information on the various modes of transportation service to the Island. If you have any questions in regards to travel planning, please contact our office. Trip participants are responsible for ensuring that you are in possession of a valid passport and/or have the necessary documentation and have obtained any required visas for entry into Canada. Pacific Northwest Expeditions Ltd. does not accept responsibility if you are refused entry because you lack the correct documentation. For detailed information on entry requirements into Canada, visit the Government of Canada's Requirements to Enter Canada page. Persons under the age of 18 traveling with one parent may require a notarized letter signed by the other parent providing permission to travel. If a traveler does not possess the required documentation, airline carriers reserve the right to refuse the boarding of flights and Canada Customs may refuse entry into the country. We strongly recommend you contact your travel agent and / or airline to inquire into proof of citizenship requirements, well in advance of your trip departure date. All non-residents of the province of British Columbia are advised to review their medical and travel insurance policies to ensure that you have adequate coverage for the duration of your visit. You will want to check your plan to ensure that you have coverage in the event you require medical treatment, and/or emergency medical evacuation for the duration of your visit to British Columbia. Accommodations prior to or after your trip are not included in our trip packages. Our multi-day sea kayaking adventures require that you arrive at the point of trip embarkation the evening prior to the departure date. Included in your pre-trip information is a listing of accommodation suggestions for the town in which your trip originates. Accommodation reservations should be made in advance. If you require accommodations for other Vancouver Island or mainland British Columbia destinations, prior to, or after, your trip with us, visit the Tourism British Columbia website. Tourism British Columbia is available to travelers to assist in accommodation bookings, and to provide other visitor services and activities information. For current British Columbia highway conditions, border crossing traffic wait times, and other travel information visit DriveBC. If you are flying into Vancouver, BC and planning to rent a vehicle for your visit to Vancouver Island, you may want to consider the Island Link Express Bus service to Nanaimo and renting a vehicle here on the Island. More information on this service is available here>>. On Vancouver Island National Car Rental and Budget BC are your best choices in car rentals. Victoria to Nanaimo - 111 km (69 miles) Approximate driving time 2 hrs. Nanaimo to Tofino - 206 km (128 miles) Approximate driving time 2.5 - 3 hrs. Nanaimo to Ucluelet - 180 km (112 miles) Approximate driving time 2.5 hrs. Nanaimo to Port McNeill - 352 km (219 miles) Approximate driving time 4.5 hrs. 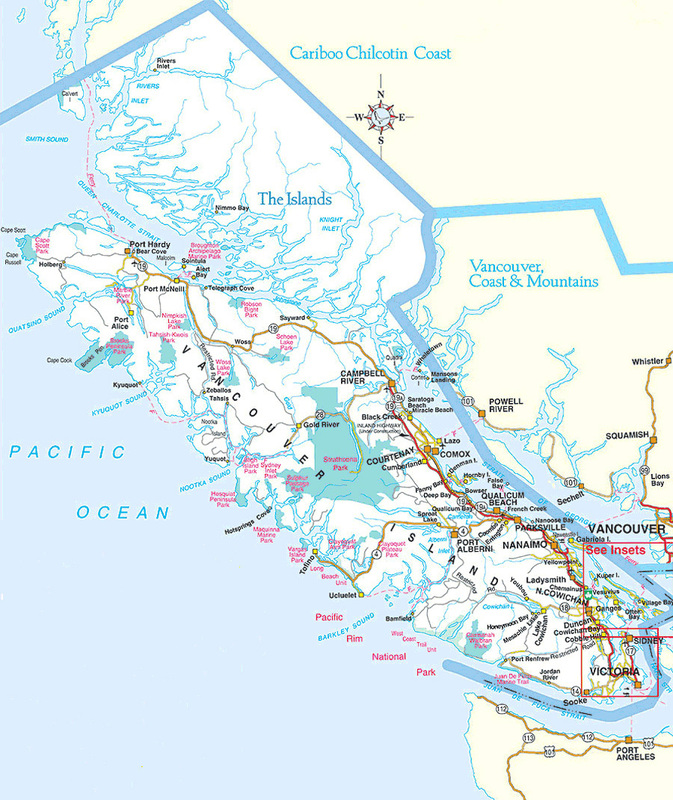 For a map of Vancouver Island, visit Google Maps or view this map of Vancouver Island. Current British Columbia Weather information from Environment Canada. Events resource for Vancouver Island.